Martin Luther King Jr. goes down in history as one of the principal leader of the civil rights movement in the United States and a prominent advocate of nonviolent protest. King's challenges to segregation and racial discrimination helped convince many white Americans to support the cause of civil rights in the United States. King was born in Atlanta, Georgia, and was ordained as a Baptist minister at age 18. He graduated from Morehouse College in 1948 and from Crozer Theological Seminary in 1951. In 1955 he earned a doctoral degree in systematic theology from Boston University. While in Boston, King met Coretta Scott, whom he married in 1953. In 1954 King accepted his first pastorate at the Dexter Avenue Baptist Church in Montgomery, Alabama. Montgomery's black community had long-standing grievances about the mistreatment of blacks on city buses. Heading the year-long bus-boycott against segregation in buses, King soon became a national figure. 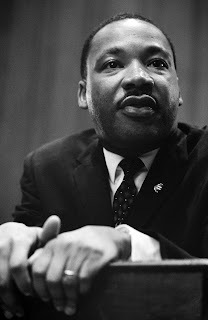 In 1957 King helped found the Southern Christian Leadership Conference (SCLC), an organization of black churches and ministers that aimed to challenge racial segregation. King and other SCLC leaders encouraged the use of nonviolent marches, demonstrations, and boycotts to protest discrimination. King and other black leaders organized the 1963 March on Washington, a massive protest in Washington, D.C., for jobs and civil rights. King delivered his famous "I Have a Dream" speech to an audience of more than 200,000 civil rights supporters. The speech and the march created the political momentum that resulted in the Civil Rights Act of 1964, which prohibited segregation in public accommodations and discrimination in education and employment. As a result of King's effective leadership, he was awarded the 1964 Nobel Prize for peace. Throughout 1966 and 1967 King increasingly turned the focus of his activism to the redistribution of the nation's economic wealth to overcome entrenched black poverty. In the spring of 1968 he went to Memphis, Tennessee, to support striking black garbage workers. King was assassinated in Memphis on April 4, 1968.